Balance is the key to Carlsbad’s reputation as the jewel of San Diego County. And that balance is a result of a vision by community leaders over the years. 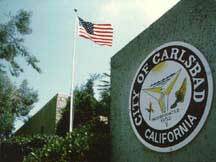 Michael Holzmiller, Planning Director for the city of Carlsbad, explains: “What we’re trying to create in Carlsbad is a city with a balance of tourism, employment, light industry and the environment. We’re a wonderful community now, but we want to make sure we remain that way in the future. “The key is to make sure we balance the different parts of our vision. Economic development is important, but so is the environment. Single-family housing is important, but so is the need for multi-family housing.